The province of Ontario, like the state of Vermont and the province of Quebec, is one of the world's biggest exporters of pure maple syrup. There is nothing like the scent, taste and texture of its golden sweetness. 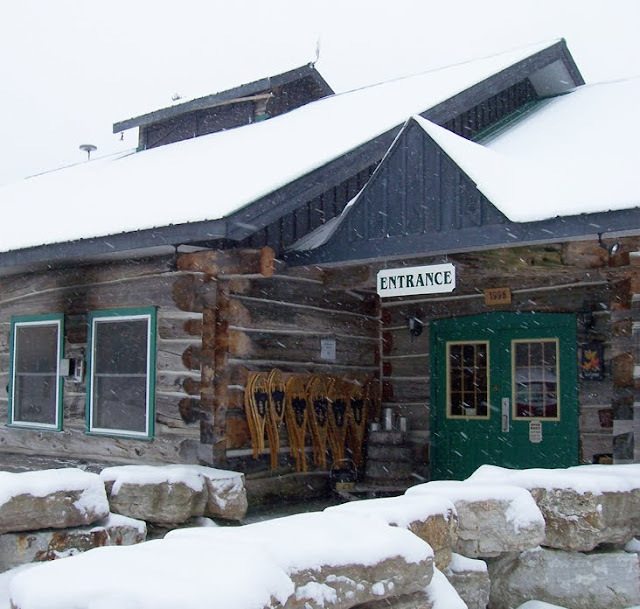 Not far from our family's cabin is one of North America's largest maple-syrup producers. Wheelers was founded in 1978 when Vernon and Judy Wheeler tapped their first maple trees on their 730-acre property. 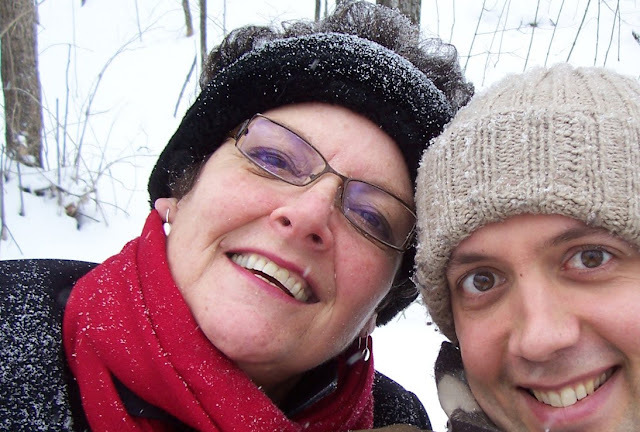 Their children (Mark, Angela, Kristen and Tracy) are still active in the production of maple-syrup here and help maintain the Wheelers family business. The pancake hosue and sugar camp was constructed in 1996 and it has been successful ever since, playing host to school field-trips, tourists and locals alike. We really enjoyed our morning here! This sign welcomes visitors. We decided to park the car far from the entrance so that we could walk through the beautiful surroundings. We came upon many webs of hoses that connected all the maple trees we passed - clear signs of the maple-syrup production on the property. 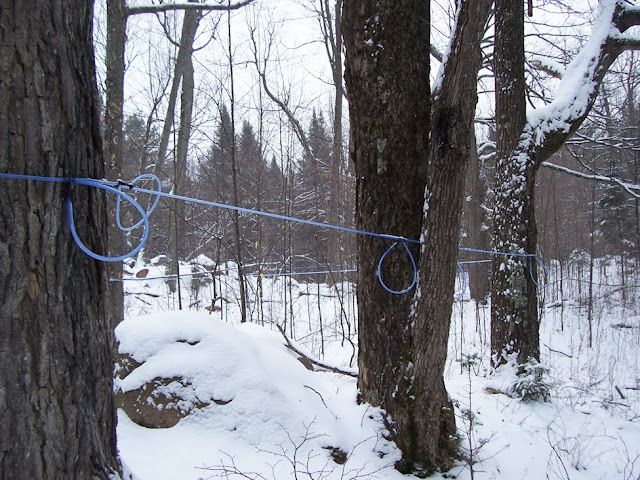 Plastic tubing winds through the forest, collecting the sap drippings from the maple trees. Sugar maples, red maples and black maples all yield the special sugary sap that eventually becomes syrup once it is processed. The trees are tapped and the sap feeds into the hoses. These smaller blue hoses feed into larger hoses that connect to large barrels where it is then collected and boiled down carefully to obtain the purest syrup. Spring is the busiest period for maple-syrup producers since the sugars and starches that the trees store during the winter begin to circulate again in the spring, which is when the greatest harvest takes place. 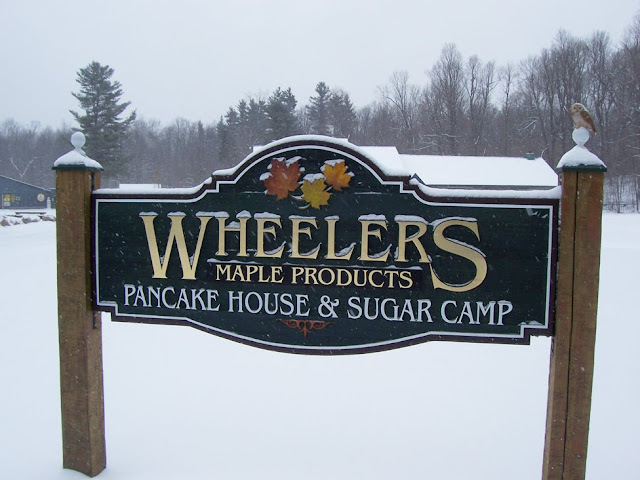 Wheelers is open year-round for delicious pancake breakfasts that employ the use of their homegrown maple syrup products. This is the entrance, above. Notice the snowshoes stacked by the doors. These are available for rent for long winter hikes through the 14-kilometers of nature trails on the property. 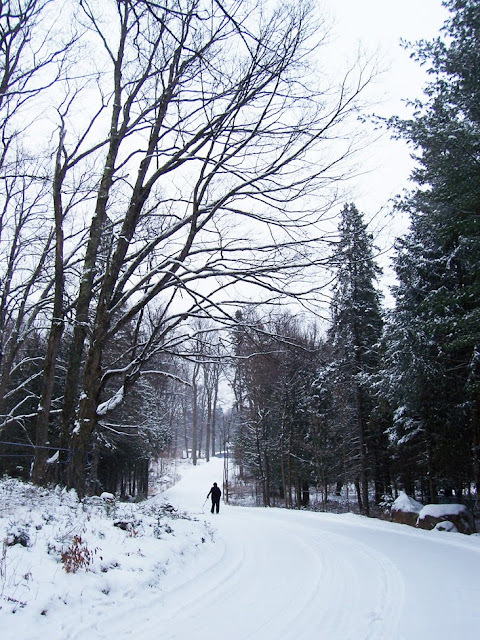 Cross-country skiers are also welcome to explore the property. All of the exterior logs are reworked from century-old hay barns that once graced the property but that were too insecure to remain standing. Adjacent to this building is a museum devoted to the history of maple syrup production in Ontario. We came for breakfast on a Friday morning. As you can see, it was not busy at all on this January morning, but during March and April, when maple-syrup production is at its peak, you are not likely to find a seat anywhere! We actually had the entire place to ourselves on this morning but the fire in the big stone fireplace was still burning and our hostess, Angela, was gracious and warm. The lumber that you see above was sawed and dressed at local mills from trees on the property. 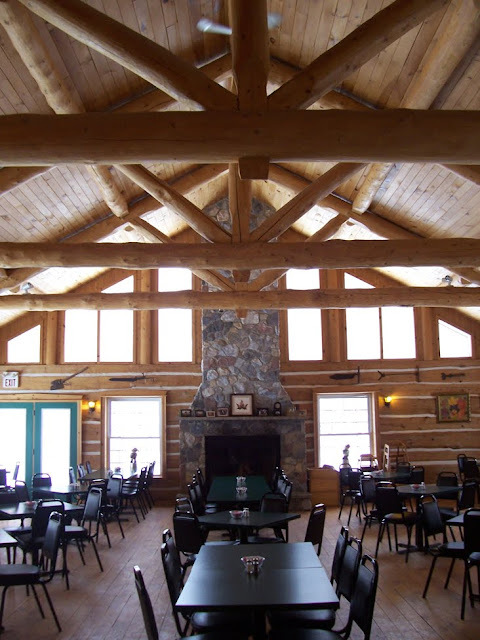 One full year of production went into the construction of the building , using over 50 thousand board feet of lumber, 20 kilometers of electrical wire and a quarter of a million nails! There were beautiful, handmade paper snowflake decorations in some of the windows. I really loved their three-dimensional effect. You will notice the larger collection tubes in the background outside the window. These feed into the production hut where the sap is collected and processed into syrup. Mmmmmmmmmmm! The pancakes were light and fluffy and drizzled with light maple syrup. They were served with a slice of French toast and three small breakfast sausages. Grading is based on the colour and flavour of the syrup, which can be influenced by many factors: the type of maple, the temperature of the winter air, the cleanliness and age of the equipment used to harvest and produce the syrup and how long the sap is boiled into its syrup form. Generally, the warmer the raw sap is, and the longer the sap sits in its collection vessels, the darker the syrup and the stronger the flavour. 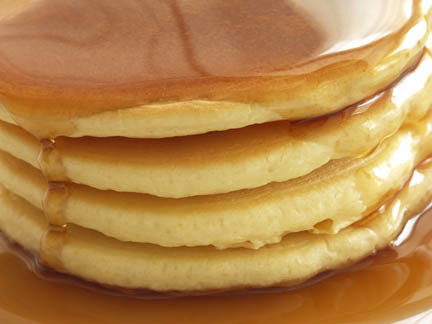 All maple syrup is the same density, despite its consistency and colour. EXTRA LIGHT #1 SYRUP: The lightest in colour and the most delicate maple syrup. LIGHT #1 SYRUP: Darker in colour with a distinct maple flavour. MEDIUM #1 SYRUP: Even darker in colour with a slightly more robust maple flavour. AMBER #2 SYRUP: Dark colour with very strong caramel-like flavour. Perfect for baking and cooking. DARK #3 SYRUP: Very dark colour and an intense maple flavour. Generally only for commercial use (i.e. maple flavouring.) My mom and I look very happy after our delicious pancake breakfast! Time to walk it off! What a lovely photo of you and your mum Andrew. This looks like such a great way to spend a morning. I was recently reading about maple syrup and now I am starving for pancakes! One day maybe I will manage to visit. Andrew, that looks yummy! I must confess that I don't think of visiting a sugar bush until well into spring, and then the crowds are massive! You and your mom had the right idea. P.S. 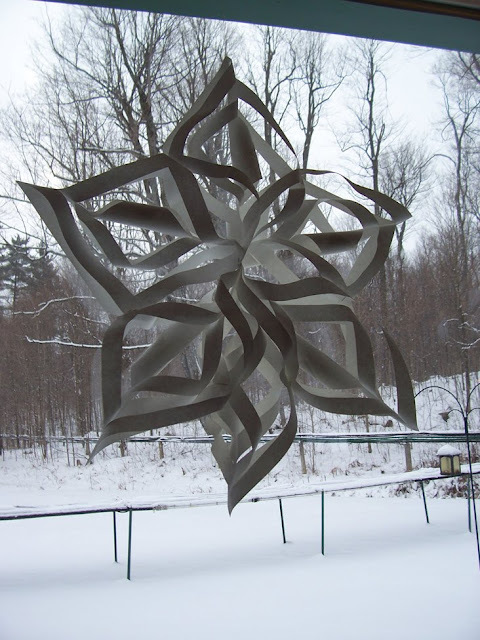 Visit my new blog and tell me what you think..
What a fun post. I enjoyed it. I would love to catch those Martha Stewart episodes as most everything is on my list of foods to attempt to bake and make!